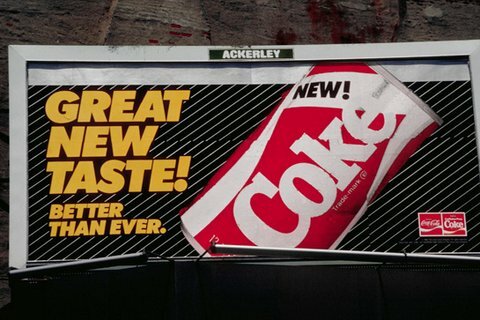 Were you excited about the arrival of New Coke? Do you still have some old LaserDiscs stashed in the back of your closet? These products that failed also happened to be among the most overhyped in history. That's the sort of thing that keeps CEOs awake at night, because overhyped products that fail also tend to be public relations nightmares. Predicting a failed product is not as easy as it might seem, however, since products can fail for a lot of reasons. It could be that no one wants it, or that an unexpected fatal flaw arises, or that it's just not that good. Overhyped Products That Failed No. 1: New Coke. Perhaps the most amazing product blunder of all time, The Coca-Cola Co. (NYSE: KO) launched New Coke in 1985 in response to market share losses to rival PepsiCo, Inc. (NYSE: PEP). Incredibly, the company replaced its flagship product with the new formula rather than simply adding a new beverage to the product line. Public outrage ensued, and Coca-Cola was forced to bring back the "Classic" drink just 79 days later. Overhyped Products That Failed No. 2: The Zune. Five years after Apple Inc. (Nasdaq: AAPL) reinvented the portable music player with the iPod, Microsoft Corp. (Nasdaq: MSFT) came out with its copycat Zune player, hoping to get a piece of the action. The problem was that while the Zune was more or less as good as the iPod, it was a Johnny-come-lately product trying to crack a market that the iPod totally dominated. The iPhone and iPod Touch debuted within a year, further dooming the Zune. Microsoft was forced to give up on the product altogether in 2011.